How "Gandhi" surname came to Indira Nehru even after marrying Feroz Khan? Feroz's father was a Pathan Muslim & mother a Parsi, both were married after love affairs & his mother embraced Islam. 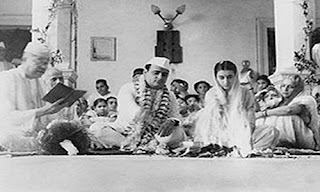 Indira's nikah with Feroz Khan was solemnized at Jama Masjid, at Clock Tower Chowk mohalla of Allahabad, UP, where earlier Nehru's sister Vijai Laxmi Pandit too was married to Shri Syed, an eminent journalist , after changing her name to Aisha. Later with Gandhi's intervention Syed was posted as Indian diplomat in USA . A little later, a new boy, Shri Pandit was grought, lived in Nehru's house, befriended Vijai Laxmi, both fell in love & married to each other WITHOUT DIVORCE of Vijai Laxmi from Syed. Syed never returned India & died in cairo. Vijailaxmi immediately went there alone & wept bitterly holding his grave for a long time. Indira was married to Feroz secretly through love affair, changed her religion & converted to Islam & had a new Islamic name too. Also, when this created stir in Nehru's house, after a lot of infighting between her & father, the matter was presented to Gandhiji again, who after a lot of thought, put a condition for acceptance that Feroz should change his surname from Khan to Gandhi, of his mother's father's surname. He agreed M K Gandhi's condition. Every problem in Nehru family was being solved by M K Gandhi, mostly by tricks. Feroze Khan was educated at the City Anglo-Vernacular High School and Ewing Christian College, followed by the London School of Economics. He abandoned his studies in 1930 to join the struggle for Indian independence. Feroze grew close to the Nehru family, especially Indira's mother Kamala Nehru and Indira herself. Feroze helped nurse the ailing Kamala, and briefly traveled with Nehru, Kamala and Indira to Europe. Even before Kamala's death, Indira and Feroze had begun falling in love. There is some evidence that Kamala herself opposed the match, and Nehru was also known to be personally averse to Feroze. Indira and Feroze grew more close to each other in England. They married in 1942, after Feroze altered his surname to adhere more closely to the leader of nationalistic sentiment of the time. Arrested and jailed during the Quit India Movement less than six months after their marriage, he was imprisoned for a year in Allahabad's Naini Central Prison. Indira was also imprisoned. In 1944, she gave birth to Rajiv Gandhi, a future Prime Minister. In 1946, Sanjay Gandhi, was born. Indira and Feroze settled in Allahabad with their two young children, and Feroze became editor of The National Herald, a newspaper founded by his father-in-law. Feroze Gandhi contested elections to the Parliament of India in 1952, independent India's first general elections. His wife served as his campaign organizer, and Gandhi won. But Feroze soon became a prominent force in his own right, criticizing the Government of his father-in-law and beginning a tirade against corruption. His exposure of a scandal involving major insurance companies and the Finance Minister T.T. Krishnamachari caused the latter to resign, and caused Nehru a major embarrassment. Feroze began building his own reputation and small coterie of supporters and advisors, and continued challenging the government. He was re-elected in 1957. The marriage of Feroze and Indira was tumultuous, as Indira began living with her father, who was alone, and cared for him personally and often acted as his private secretary. When he became an MP, Feroze started living in his own house in Delhi, away from his father-in-law and wife. This unwilling separation embittered Feroze, and it is speculated that he was having extra-marital affairs as a way of getting back at Indira. Indira and Feroze were re-united in 1958, when Feroze suffered his first heart attack. Indira took him to recuperate in Kashmir, where with their young boys, they were together again. However, Feroze died in 1960 of a second heart attack. Had Rajiv “Gandhi” retained his father’s surname, there was least probability that Hindu majority would accept him in that scenario.